12.1-25-03. Engaging in a riot. a riot is not an offense under this section. 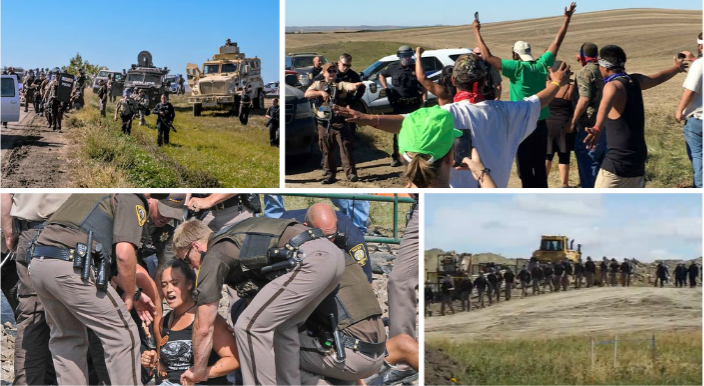 Perhaps it is time to reverse the table and file a civil rights complaint against the Morton County Sheriff Department for knowingly making false criminal charges to violate the civil rights of the water defenders. Looks more like the police are trying to incite a riot. The police & non-Indians are so used to treating the indigenous people however they want to, like they are doing you a special favor to treat you like a person. Well how do they usually treat the American Indians like they are worthless garbage? Look at the extreme militarization of the police at Standing Rock, they are not there to protect the religious and constitutional rights of the people gathered, who have not committed any acts of violence. File civial rights. All natives doing protecting water and praying. Cannot drink oil n eat it. There's been enough oil spills time to stop drilling for oil. This is Mostly About Native American Indians and where they Stand in this World �� And what Rights we Really have, wich as you Can see none, We Stand together as One, NATIVE LIVES MATTER!! This only includes the violations of 1st Amendment Rights, but other Rights retained by the people also apply. Each official, including all police/military forces members, is sworn to uphold and defend the Constitution of the United States of America against all foreign "and domestic" enemies. Such is a fact of law and the Constitution is thee highest law of the land. Any rules, regulations or laws which violate the Constitution are null and void upon the face of them. Any official, be they high or low, which acts in violation and attempts to impose UN-Constitutional rules, regulations or laws is in fact in violation of the Constitution of the United States of America and all International Rules and Laws which the United States of America is signature too. "The First Amendment (Amendment I) to the United States Constitution prohibits the making of any law respecting an establishment of religion, impeding the free exercise of religion, abridging the freedom of speech, infringing on the freedom of the press, interfering with the right to peaceably assemble, or prohibiting the petitioning for a governmental redress of grievances." The actions against the people/Water Protectors at Standing Rock are in clear violation of every single clause within the 1st Amendment. They gather in prayer as a religious right and for officials to impede that in any way violates the Religious Rights of the people set forth in the First Amendment of the Bill of Rights. Including the Peoples Right to travel to and from such religious events and participate in ceremony, prayer, mediation and thought in them. Freedom of speech is certainly being violated as they try to impede such and even deploy weapons which have the capability of electrically disorienting people rendering them incapable of speech. Freedom of the Press is certainly in violation as local officials press warrants for members of the press covering the story, clearly threatening and impeding the legitimate press freedoms guaranteed within the 1st Amendment. Freedom of peaceful assembly is most certainly in violation when in fact that is exactly what the people at Standing Rock are involved in doing. Deploying armed police and military forces in order to try to suppress the freedom to peaceably assemble violates the 1st Amendment. The Freedom to petition the government for redress of grievances, which in fact the actions at Standing Rock is in violation as "officials" try to impede and suppress the right to grievance in relation to the destructive and hazardous pipeline(s) and the threat to the water supply of not only the First Nations/Native Peoples of Standing Rock but the water supplies of millions of Americans who live downstream. Such outright violations of the Peoples Rights are in fact acts of treason and warrant criminal changes against all who are in violation of the of the highest laws of the land contained within the Constitution of the United States of America & Bill of Rights, and is in violation(s) of the Treaty Rights of Native Americans recognized nationally and internationally. As well as all International Rights contained in every Treaty and Law which the United States of America is signature too. Please know that many non Native's are there in support of the people. Many more non Native's stand strong with our brothers and sisters who are protecting our right to clean water. 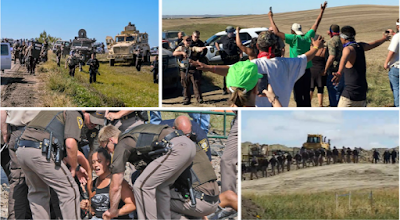 We do not under any circumstances condone what is happening in the 'Police State of North Dakota" Together we are standing, for our children, our Great grandchildren and the next 7 generations. Protest at the SOURCE OF THE PIPELINE! Office phone numbers, fax numbers to clog their lines, mailing address and entire Board of Trustee member in Dallas. You can also find Kelcy Warrens home address to protest on his front lawn in Preston Hills Estate. He also have a multi million dollar home near Telluride, CO called Book Jack Hills Ranch. emails, phone, address to send protest there. There is ALSO an entire list of recording artist...many famous that you can access to send messages to them via their facebook, twitter, or even show up at one of their concerts.